I’ve got networking on the brain, because I’m about to update the lessons I teach for Quiet Power Strategy. 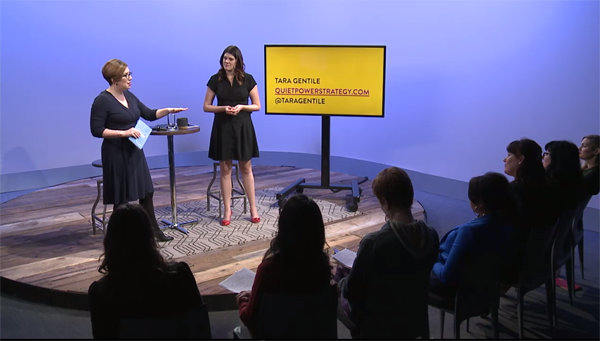 Formerly named 10ThousandFeet, Quiet Power Strategy is an intensive group coaching and business mastermind that I lead along with Tara Gentile. If you don’t also follow Tara, and you’re hearing about Quiet Power Strategy for the first time, you can check it out here. In a nutshell, we lead 40 business owners in creating a personalized business plan that leverages your strengths as the owner, so you can reach your goals with less effort, heartache and time. After the first run of the program in 2013, which I participated in as a student, Tara brought me on to teach three lessons on media and networking. Now that you have the context for my current mindset, imagine this. I’m sitting at my kitchen table, checking my morning emails. I haven’t eaten breakfast yet, and I’ve just started my first cup of coffee. As I filter through assorted junk emails and some possibly promising opportunities. I see a note from one of our clients. When I open it up, I see a screen shot showing that said client is being chatted up on social media by a VERY BIG NAME. As a media strategist and someone who teaches others how to “meet the people you want to meet and ask them to help you achieve your goals,” as the Quiet Power Strategy sales page so succinctly puts it, it’s my job to step up and counsel our client on how to make the most of this opportunity. As far as I can tell, we have three options. Which would you do? A: Internally freak out that this VERY BIG NAME commented on your work, but externally do nothing. B: Wrack your brain for something to ask of VERY BIG NAME, while you have his or her attention. C: Reply and try to engage this VERY BIG NAME in conversation. What we see play out most often is one of the first two options. It’s like this: If you were standing in line in a coffee shop behind a celebrity, would you play it cool and say nothing (option A) or ask for an autograph (option B)? That’s the path we advised to our client. This isn’t our first instinct. Despite teaching this exact framework for approaching influencers in Quiet Power Strategy, when our client shared the screenshot, it was hard to stay cool. As publicists, Maggie and I are more likely than the average person to go for the ask. Did we do our due diligence by checking for a natural and authentic opportunity with this individual? Absolutely. As is often the case, there was nothing our client could possibly ask a VERY BIG NAME after one interaction that would be half as valuable taking the next step in building the relationship. I mean, look at me. The first time I met Tara, she ran a massively popular lifestyle blog, Scoutie Girl, and I’d just quit my job the week before to dedicate myself to starting some sort of PR coaching business. Our relationship evolved over Tweets and blog post comments (back when those were still an effective relationship-building strategy), and when we met, I resisted the urge to fan girl her. And now look at us, sharing the stage at Creative Live and leading 40 business owners to shake the bound to fail feeling that inevitably arises over the course of running your business, raise the bar and create unplanned revenue. If you ever find yourself in our client’s position (and it’s more likely than not that you will be! ), how will you respond?